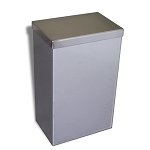 In May 2014, students at the Foothill Christian School in Glendora, California dedicated one of our time capsules (the Pluto 14x14x20" stainless steel). They'll see the items again in 25 years - with happy future memories. A lot has changed since Foothill Christian School began in 1964. School officials are preserving a record of 2014 for future students and faculty to see. 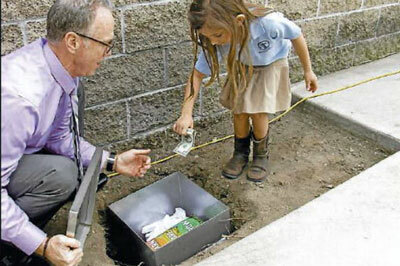 The Glendora school buried the stainless steel time capsule box at the campus playground to celebrate the school’s 50th year. 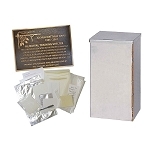 Marking the spot is a bronze plaque with instructions for opening it in 2039. Note: if you are doing a similar project, be sure the time capsule is seated further below the surface than this one shows. You want as much insulated area above the time capsule as possible. 18 to 24" is recommended. 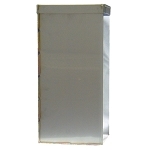 Please see our blog article on insulation for more information.